These daily tournaments (2pm, 6pm, and 10pm) have really come into their own this year, particularly the 2pm, which has begun to draw fields of nearly 1,500 entrants, driving first prize to $50,000. Not a bad return for fourteen or fifteen hours of play, if you can make it. Rio Pavilioon Room at 7:45am. I didn’t, at least in my first venture since getting to Las Vegas Wednesday night. MH, my host for the first week of my stay in Vegas did make it to the cash, however, while my Doubles partner for next weekend made it farther than myself but just short of a payout. I started off in BB and got right into the action with Kx5x, making top pair on the flop but losing to a turned two pair from UTG who’d limped with 6x7x. We only had three players seated at the table, so play moved pretty fast at first. Ten minutes in and I was UTG, limping in with 7x7x. Another 7x hit the turn, but by the river anyone with a six had a seven-high straight, but I called a bet from an aggressive player in the nine-seat and won my first pot. I was down, though, and after paying my blinds on that round I counted T14625. I opened with a bet of 150 from CO holding A♠2♠ and BB called. There was an ace on the flop and a deuce on the river. I bet 250 on the flop, checked the turn, and 300 on the river, and won the pot, which put me back above starting stack. UTG1 holding 9x9x, I opened 125 and both blinds called. The flop was 9♣7♣5♣ and I obviously didn’t have a club myself, but I bet 300 to take it down. On my BB with Kx3x there were three limps to a KxKx5x flop. UTG opened with 275 and got a call from SB. I raised to 750 and they both folded. This time, after the blinds, I was up to T16,025. In UTG2 with 3x3x, I opened with 225, getting calls from CO and SB. The flop is [1x]4xTx, and I continued with 400. CO calls, but SB raises and I fold. At showdown, CO loses a bunch of chips to 4x4x. I drop back down to T15,400. A couple of hands later, I have the 4x4x and limp. A couple others come along but someone decides to raise to 525 and two of us come along to a flop of AxTxQx. I fold to a bet of 600. Now I’m back under starting stack, at T14675. J♠T♠ on CO and I call UTG2 (the aggro player in seat 9) raise to get to the AxQx8x flop. I call his bet and my Kx shows on the turn. I bet 700 and get a call. There’s nothing scary on the river, I bet again, and he calls again. He’d just been beat by Broadway by an older (I mean, older than me by quite a bit) gentleman on my immediate right, and he looked pretty unhappy to have missed this (or thought I was just bluffing). Back up over T16,000. UTG2 with 5♦8♦ and I raised 225; BTN raised 1,025 and I quickly folded. I ended the first hour of play with T15,850. Blinds were 100/200, and the last of the players for our table showed up, so we were finally truly ten-handed. I limped from UTG3 with A♦7♦ into a 4-way pot, then BB raised to 1,300. I called and we sat A♠5♠T♥ heads-up. He bet 1,050 and I thought for a while, didn’t feel good about the seven or the lack of diamonds on the board, and tossed my hand. The next hand, I had “the best drawing hand in poker”: QxTx. I called a raise to 425 and there were four players to the AxKxTx flop. Seat 9 went all-in for his last 3,150 chips, having been beat by two Broadway straights already. I called, and a third Broadway knocked him out. UTG, eighty minutes in, and I had T19,275. About ten minutes later, blinds went up to 150/300/25 for the last round before break. Playing my “Jordan” strategy, I raised to 625 UTG with 2♥3♥. BB called. The flop was 7xQ♦7♦. I bet 750 on the 3♦ turn and got called again. An see on the river put me off the hand and BB flipped over AxKx. Guess I wasn’t aggressive enough on the turn. Maybe he wouldn’t have believed me anyway. UTG with KxQx, raised to 700 and made top pair on the flop but folded on the turn with a flush draw on the board. More king action with K♦T♦ on BB. The flop was a decent KxQ♣T♣, and was checked heads-up. 7♣ on the turn and UTG1 went all-in for a small stack; I called and he had Qx7x for a lesser two pair. Neither of us had clubs. My hand held and I knocked out another player. 3♦6♦ on BTN, I needed a four for a straight on the flop; called 900 to see a flush draw roll out and a T♠ on the river and folded my nothing to a bet (or “Tibet”, as my iPhone corrected my typing). Still, as we neared the end of the second hour and the first break, I was up to T25,050. Our table broke, and I started the next session across the room. 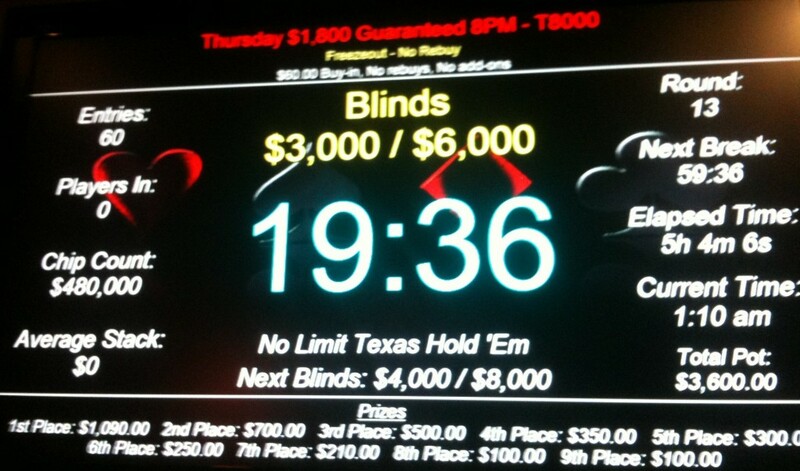 UTG3 and I played the KxTx that had been my last big win for 1,100 in a 3-way pot. Everyone checked to the river, and an ace-high won. Bet 900 with K♥4♥ and won a pot uncontested from UTG2, then limped from UTG1 with K♠7♠ for 400 and folded to an all-in from SB. By the time I was on BTN, I had T23,550; there were two big stacks of 40,000 or so on my right, blinds were going up to 300/600/75 and I wasn’t getting much in the way of playable cards in the last half of the third hour. From HJ, I opened to 1,200 with 6x9x. The flop was Kx3x5x and was checked around. A 4x on the turn gave me the open-ended straight draw. I bet 1,500 and called a 3,500 re-raise. I folded to a bet on the Jx river. Down to T17125 by the time I was UTG3. I picked up AxKx The flop was all low clubs and we checked it. K♣ on the turn. I bet and got a call and somehow won the hand. T22,525 on BB. And another table move. Halfway through the fourth hour, I called a raise from BB with Q♥7♥. The flop had a king and a queen and I raised a bet to take the pot. Won the next hand with A♠T♠ and a re-raise, then I was moved to another table again. In CO, with blinds at 400/800/100, I had T26,550. There were about 950 players left. UTG4 with K♦9♦, I opened to 2,200. CO called, the flop was 7♣8♣5x. I bet 2,400, CO went all-in and I folded. UTG with 4x4x, I raised to 2,400. UTG2 called. BTN shoved his stack of 3,700 in and BB called. UTG2 came along. The flop was 2x2x5x. BB bet 8,500. I raised all-in, UTG2 folded, and BB called with AxKx. BTN was holding Ax7x. I have a straight by the river and take the whole pot. We were four hours in, I had T42,200, blinds were 600/1,200/200. I was above average, but my M was only 11! Last hand before the second break, I was UTG with 7x7x. I hit a set on the flop, there was a straight draw on the turn, and the case seven on the river made a flush possible but I wasn’t too worried about it. I did my best “nervous amateur” act after putting out 17,000 in chips on the river, hoping the last guy in the hand would shove, but he just called. He said he saw my pulse pounding, and I suppose it was, but I felt pretty calm with quads. I went into the break with T87,200. In HJ four hands after break and I get A♣A♦. As the dealer’s picking up discards from the end of the table, I get a flash of a red ace and because I’m a scrupulously honest person, I call it out, assuming that someone else might have spotted it, too. I thought it was the diamond because I hadn’t memorized my suits after a brief look at them, and I didn’t want to look back at my cards then say, “Oh, no, it was the heart.” A player in middle position raised to 4,200 and I re-raised to 12,500. He folded and I showed the aces, saying I really hadn’t wanted an ace to flash. Picked up Q♥J♥ right after that and called 4,400 but folded to a bet with 9♠9x7♠ on the flop. By the time I was UTG2 again, I had T86,400, the biggest stack on the table. That wasn’t to last. I called a 3-way pot from BB with J♥4♥ for 3,400 and folded on a clubby flop with nothing. Raised 4,500 with KxTx and SB made two pair with 6x7x. Missed entirely with a call of 4,500 and 6♦9♦. Lost another 6,000 calling AxKx with JxTx. In twenty minutes, I blew more than 20,000 chips. Called a CO all-in for 9,000 from BB with 9♣2♣ (blinds were 1,000/2,000/300). and won. Then I lost a big chunk with AxQx raising 5,000 and looking at a JxTx8x. I called 8,000 more but while I made my straight by the river with a nine, a jack on the turn and a flush possibility gave me pause and I had to fold. Maybe the smartest move I’d made all tournament, but costly. UTG2 with 6x6x and I called a 6,000 raise in a 3-way flop to see 3♥3♦7♦. UTG checked and I bet 12,000. UTG3 (the afore-mentioned problematic player) went all-in for almost my entire stack. I didn’t have a diamond. I folded. I was holding T48,000 for my BB. Played K♦2♦ and lost another 6,200. With T34,800, I was on the verge of calling with KxJx against two all-ins ahead of me. A catch would mean more than a triple-up. But I played it safe and folded against QxQx and TxTx. Naturally, a king came on the flop and would have taken the pot. UTG with Q♦9♦ and I raised to 7,000, getting two calls and a flop of 4x5x5x. I bet 7,000 and was called. I checked the king on the turn and BB bet 20,000. I folded. I had T19,100 left for my BB. And 7x2x. With just T12,600 on BTN and blinds at 2,000/4,000/500, I was looking for any hand that had a maximum number of callers in the hopes that I could manage to take down a pot with multiples of my stack. Any two cards would do. With three all-ins ahead of me, all with more than my stack, I pushed my chips in with 3♥5♣. There was a player with 8♠8♦, an A♦K♦, and an AxT♠. The flop gave me some hope, with 7♥6♠J♦. All, I needed was a four to quint-up (what with all the antes). But another seven came on the turn; a queen on the river, and the eights took the whole thing. Out a couple hours before the cash started kicking in. Eight hours and twenty minutes. Around 300th of 1,435 entries. It’s been a busy couple weeks here at Mutant Poker Central, as I get ready to head down to Las Vegas to see if the minor success I’ve had in Portland can finally translate to an out-of-town venue. So far, I’ve struck out at Foxwoods, the Venetian (twice), and Pendleton, but the number of events I’ve played too small to be statistically significant. So much to do with plans to be in Vegas for two weeks. First off, my venerable card cover—the helmet off of a figurine of Professor Frink from The Simpsons—has seen a lot of wear over the past couple of years. I’ve been hoping to find a way to get it machined in aluminum and asked a friend with a CNC machine shop about it but, as expected, he said it would cost an incredible amount of money to get it made. 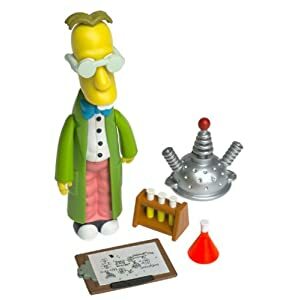 He did mention that there were 3D printers who did metal pieces, though (he has a plastic 3D printer) and when I looked into it, I found Shapeways.com, which will print your 3D designs in just about everything from plastic to glass to silver to a stretchy polymer. All of my 3D design software is on my old pre-Intel Mac, and at first I was a bit stymied about how I was going to develop the model but eventually I managed to pick up enough about the free, open-source 3D tool Blender to get my model done in a day. With a couple of missteps, I managed to get an order in for copies in alumina and stainless steel and hopefully they’ll arrive before I set off for Vegas (didn’t happen, but they arrived in Portland the night I left and someone special is going to ship them). If you’re from Oregon and you see the cap, say hi to the Mutant. Then I got an offer of a free room from MH—Portland player and fellow college alum—for nearly half my stay, so that was fine. I spent an evening running an alumni tournament with him during the annual reunion weekend. Paying bills up, getting some decent summer clothes together (it’s supposed to be 108° in Vegas next week). A lot of stuff to do. Since I’m driving down (and it’s supposed to be 108° in Vegas), get the car checked out for its 50,000-mile service. Plus, of course, there’s the last-minute drive to build up the bankroll a little bit. I wasn’t taking perfect notes on this tournament, but I hit something in the first ten minutes on a 7x7x7x3x3x board that put me up about 1,700 chips. I played K♦3♦ from SB at the half-hour mark and hit the bottom of the flop, but a jack and a bet of 1,500 on the turn made me fold, so I was back down to 8,800 after that hand. UTG1 with Ax2x and a min-raise got three calls but I won the hand. At the 45-minute point, I called a 1,025 chip all-in post-flop holding Qx8x on a QxKxTx flop. He had KxTx and boated on the turn with Kx. I boated on the river with Qx but nobody cared. SB with T♥4♥ and the flop was Tx4xTx. I checked, then raised to 2,000 over a 600 bet. Maybe I should have just called. 4x4x on UTG1, I tried to get people off, but the flop was horrible. BB holding 6♥7♥ and I double-paired on the flop but had to gut out a raise with a flush draw on the turn until 6x on the river made my full house and my all in won the pot. In SB with 6♠8♠ on the next hand and I saw a flop of 5x5x6x. Bet 600 and won the pot. CO two hands later and I got 9x9x I raised 700, BB goes all-in and gets two calls. Flop is KxQx7x and I bet 600. The other player calls but folds to another bet on the river and I knock out BB. At the break, I have T24,350. My first big hand after the bread was AxQx. I made a full house on the flop (aces over queens) and took most of the stack of a player with AxKx. 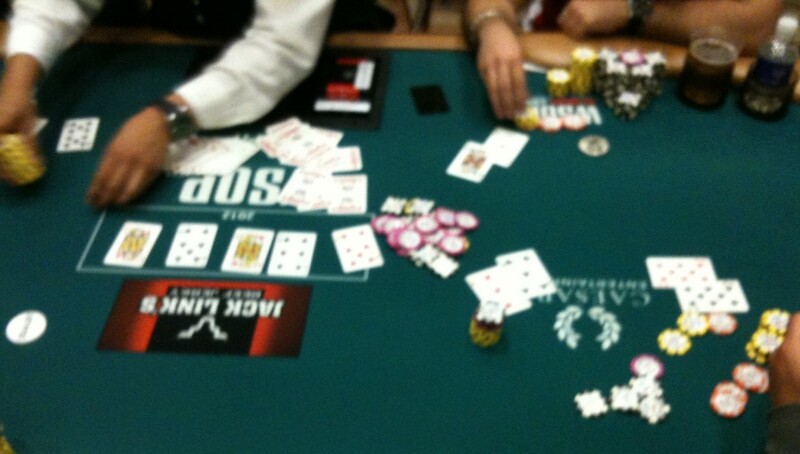 Then I picked up the suited A♦Q♦ on the next hand and won against two all-ins, putting me up to 39,900 at 90 minutes. I made a flush on the turn with J♦7♦ and took the last 3,500 from another player. Ten minutes later, I was up to 53,100. With 7x3x UTG1, I bet on the 6x6x7x flop but folded to a raise of 2,100 from BB. 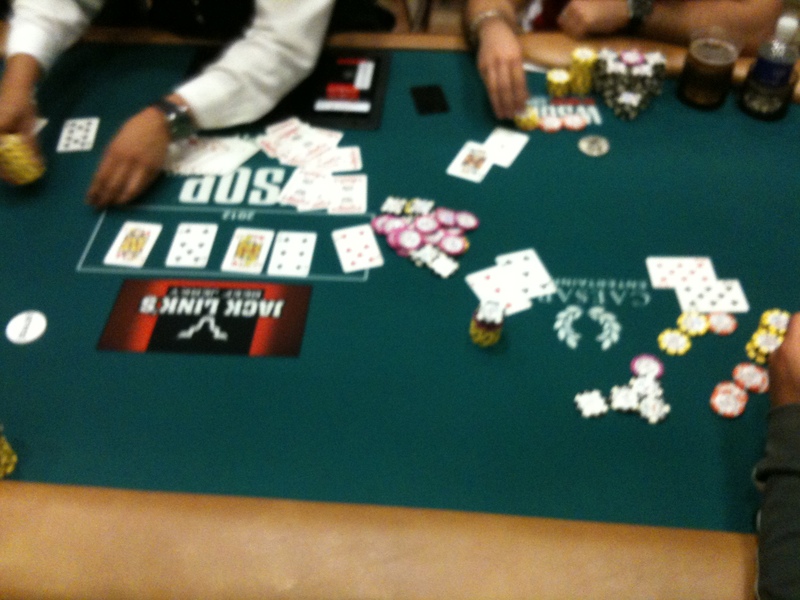 Action on that hand and a couple previous took me down under 50,000. UTG with KxJx, I called, then called a raise to 2,000 from BB. Folded to a bet on the 3x3x5x flop. Raised to 1,300 from SV with Ax2x and BB re-raised 3,300 all-in. I called the extra 2,000 and lost to AxKx. By the time I was in HJ position, just before the end of the second hour of play, I was down to 44,200, but the average stack was still way down at 13,700, with 35 of 60 players left. In UTG3, called a UTG2 raise to 1,600 along with the BB but folded to a UTG2 bet on a low flop. Just after the hour, I was down to 39,200 (average: 14545). 33 players left. Raised with K♠4♠ to 1,800 and was heads-up to the flop of 4x5x7x. A bet of 2,200 took it down. UTG with K♥T♥ and I raised to 1,800 again, getting a flop of AxQx8x. I folded to an all-in. On BB, I folded Ax8x to two all-ins (the largest of which was only 4,200). The other two players were Ax8x and AxQx, and the eight won with a pair, so I would have chopped up one of the players. My count when the button came around at 140 minutes was T37,100, still more than twice the T16,000 average. Half the field was gone. I laid low for a couple of hands, then played K♦T♦ UTG3 and raised to 1,600. UTG3 went all-in and I called against 5x5x to knock out another player. I really ought to have been playing a bounty tournament. UTG with A♥8♥ a few minutes later and I raised to 1,600, getting a call. The flop was 4x4x8x and I bet 10,000 to win. Two-and-a-half hours into the game and I was back up to T43,200. 25 players left and the chip average was T19,200. A raise to 2,500 from HJ with 7♥9♥ took the blinds fifteen minutes later; when I was UTG2 at 2:50 (with 22 players left) I had T44,400, still 213% chip average. UTG ten minutes later with 7♠7♦ and I raised to 3,600 with blinds at 800/1,600. BB called and the flop was Qx9x6x. I went all-in after he checked and took the pot. By the time I was BTN again five minutes later, there were only 19 players remaining, I was holding steady at T44,600. Fifteen minutes later, I noted that I knocked out a player but couldn’t remember with what. In any case, the number remaining was down to 17, and I had reached T63,000, 223% of average. I promptly lost over 10,000 holding 2x2x in CO with a three-bet to 5,000. UTG went all-in with 7x7x and I called, so halfway into the third hour I was back down to T49,200, this time only 143% of the chip average with 14 players left. Raised to 5,000 from CO with KxJx and took the blinds, but I was down to T47,200 on my next BTN with the average at 40,000 and 12 players left. 2x2x did me in again there when I called a 6,500 raise and folded to an all-in on a KxQx8x flop. Then I lost 13,000 as CO with QxTx after I folded to an all-in over my 6,500 raise. Fifteen minutes before the end of the third hour saw me below the average stack for the first time since the beginning of the game, with just T28,000 (70% of average). Then, about ten minutes later, I picked up AxAx in SB and raised to 6,500 to win a hand and opened from BTN to 7,000 with 4♥6♥ to take down the blinds. I tried the same thing UTG1 with A♦3♦ and got three calls to see a flop of 5x7x9x but folded to a BB all-in. Just after midnight (four hours), I’d clawed up to T30,000. With 11 players remaining, that was still losing ground, though, at 69% of average. The blinds were eating away at my stack. Without much in the way of what even I consider playable cards, I was down to 25,500 and then 19,500 after the next two passes of the button. UTG with 8x8x I shoved and was called by both a short stack and BB. They had 6x6x and 5x5x, but a set on the flop for me pretty much guaranteed my win. Next hand, an all-in with AxQx over a SB limp took it down. In the course of the next round of the button, I was up to T113,000, above the average of 80,000, with six players remaining. I was the chip leader by 1,000. We did a 6-way ICM chop; my lead (0.21% of the chips) was worth an extra $5 0.14% of the pot). Five hours. +925% ROI. Six-way ICM chop, 60 entries. Fifteen minutes in, I call a raise to 250 in a 3-way pot from UTG2 and get a 9x7x2x flop. Bottom pair and bad kicker! Just my type of hand! I called 350 to see a seven on the turn, then BYN bet 600 and I folded. BTN showed 9x9x. UTG1 with QxJx and I call 375 in a 4-way pot. I’m on safer territory with Qx6x4x and a bet of 700 takes it down. UTG with A♦6♦ and I called 900 on a flop of Ax2x5x but something about a bet on the turn scared me off and I folded. 8x4x on BB and I called down to the river after a flop of Kx7x5x but I didn’t get anywhere. On CO (what? I didn’t play two hands?) I raised to 250 with A♦Q♦ and got three calls. Ended up losing to 2x4x and a wheel possibility on the board that I completely missed. Thirty-five minutes in and I was down to T5,350. I raised UTG3 with J♣9♣ and got two calls. A bet of 1,000 on the J♠7♣5♣ flop won; I was kind of hoping all they put me on was a flush draw. That got me a few hundred back. I saw the flop with both my blinds; by the time I was on BTN I was back down to T5,500. Just after the first hour, I raised 450 from late position with A♣8♣ and was re-raised to 1,700 by BTN. Encore reg SH shoved from SB. I folded. I don’t remember what BTN or SH had, but I remember it didn’t beat what I would have had with two clubs on the flop and another on the turn. Say you’re in a tournament and there’s going to be a chop of $100,000. You haven’t got a large stack, so you’re not going to get the bulk of the money, but you’re offered a choice of $12,000 or $15,000. Is the $12,000 just as good because there’s only a $3,000 difference? No! $15,000 is much better than $12,000, because it’s 25% more, in relative terms. Of course, where that explanation breaks down is in the fact that poker odds are a zero-sum equation. It doesn’t matter in a chop if you’re taking money from someone (unless you really hate them), but when your hand’s odds improve in poker it is at the expense of your hand losing. If you have a 12% chance of winning a pot, you have an 88% chance of losing. That’s a ratio of 1:7.33. If your hand improves to 15%, it can only lose 85% of the time, which is a ratio of 1:5.66. That’s considerably better. The math skills of my fellow Americans dismay me. Anyway, I was up to T8,450 at seventy-five minutes; not quite back at starting stack. With K♣T♣ I raised on a Kx5x6x flop and BB went allin for 1,700 (even shorter stacked than me). I called and he showed bottom two pair, but a king turn and a ten on the river made my house full and my stack slightly more so. At the half-hour when I was UTG1 again, I was up to T10,100, and I bought the T6000 add-on at break. I laid low for most of the first half-hour then flopped Broadway heads-up with Q♣J♣. I checked, then bet 2,000 on the queen turn and won. UTG with AxAx and I raised 1,000, then called a re-raise. An ace hit the flop, my opponent bet and I raised all-in. He called with AxKx and I knocked him out. That gave me a little momentary fred, so when I raised to 1,300 from HJ with Q♣6♣, nobody peeped. As the button approached again early in the third hour, I’d managed to get up to T29,525, almost 40% above chip average, with 93 of 117 players remaining. The third hour was quiet, with me picking up some small pots but no major hands. Half-an-hour in, I was up to T32,425. Then ten minutes later I tried a raise of 1,800 with 9xTx from HJ, got a call, checked the AxJx2x flop, then folded to a bet of 3,500 from BTN. Blinds were up to 600/1,200/200. UTG with Q♥6♥, I raised to 2,500 and was raised by BB. I called and saw a QxQx7x flop. He shoved and I called for the knockout. A queen in the next hand meant another knockout, then I was moved to a new table, where I sat down with T77,000 (average 31,285). With just 63 players remaining, half the field was gone at the end of the third hour. Didn’t do much for the first half-hour; when I was on the button after three-and-a-half hours of play, had T73,600. Then, as CO, I called 1,600 with Qx8x in a 5-way pot. The flop was AxTx9x and I stayed with it to the river as everyone checked it, but didn’t go anywhere and folded to a bet without even a pair. Ten minutes later, I lost a chunk trying to draw a straight with Qx9x, but with an all-in on the turn, I folded and I was down to T53,000. UTG with AxJx. I call 2,000. Action folds to SB, who calls. BB checks. Flop is Jx8x5x and BB bets 3,000. I raise to 15,000 and he calls. On the river, we chop the pot. T59,100. AxAx again, this time on BTN. UTG goes all-in, HJ calls, I shove, and HJ open folds 8x8x, which would have won on the river if he’d stayed in. Another knockout. I call a raise to 6,000 with JxKx and the flop is KxTx6x. He bets another 6,000, I raise to 13,000, then he shoves and I fold. T65,000 at midnight, after four hours of play, but a quarter-hour later I’m down to T52,800. Then I move tables again. In SB, I call 12,000, flop 9x8x6x and shove, getting called by QxQx and losing 22,500. BTN a couple minutes later, all-in with KxJx over a call. SB calls with AxQx but I make a straight on the turn and double back. In UTG3, I’ve got 36,900, with the chip average at 56,314. 35 players left, blinds 2,000/4,000/500. UTG2 with A♥2♥, I raise 9,000. BB goes all-in for 1,600 more and I call. He has 9x8x, the board is Ax9x3x3x2x, and I knock out another. T52,500. BB with Q♣5♣ and SB calls. Two clubs on the flop and a five on the river and I manage to knock him off. I pop up to T95,500, back above the 61,593 average, with 32 players remaining. Blinds up to 3,000/6,000/500 and I called an all-in with JxTx He had QxTx but the jack made all the difference to fill in the holes of a straight. It wasn’t all smooth sailing. UTH with AxTx and I raised to 13,000 but had to fold to an all-in from UTG1. BB with 4x4x and I folded to an all-in of more than 40,000, though I would have preferred to see the flop. At the end of the fourth hour, I raised from CO with KxJx and made a straight. Then UTG2 with K♦8♦, I called an all-in from SB, then folded to a large all-in to see them flip over 7x7x and TxTx and a flop full of diamonds. Still, I’d climbed to T143,50, more than twice the average stack, by the time blinds got to 4,000/8,000/500. I called 18,000 with Q♠6♠ but folded after missing the flop. A couple more hands like that and on HJ, I was down to T111,000, with 24 players left and a chip average of just under 90,000. I raised UTG to 16,000 with KxTx and won, but was still slipping due to the antes. Have I ever mentioned how much I like dark checks? Not that I ever do them. UTG1 and I raised to 18,000. BB called and the flop was ten-high. He’d checked dark and I shoved, which I might have done even without the ten. Another ten-high flop fifteen minutes later matched my KxTx in a five-way call of 12,000 to the flop. I opened with a bet of 20,000—just a third of the pot—and won. In SB with 4♣5♣, I got involved in a 3-way hand to the JxTx5x flop and folded to a UTG bet of 20,000. 1:45am. Nearing the end of five hours of play we consolidate to two tables. Blinds are 8,000/16,000/2,000 and the chip average is 109,500, for an M of just over 3, well in the Red Zone. Even at 162,000, I’m in the Red Zone, with an M of 4.5. I tread water for fifteen minutes, as two players fall by the wayside, then open-raise from CO with Ax7x to 36,000 and take the blinds and antes. Another middling ace in HJ, A♠8♠ and I made the same raise. This time SB called with Qx9x, but I won the hand and was up to T245,500 with just 12 players left ten minutes into hour six. Another all-in from a short stack and I called with AxQx to knock out Qx8x just before the half-hour, then I raised Ax8x to 40,000 from SB and missed the flop, folding to an all-in. Eleven players, chip average 179,181, and I had T280,000. 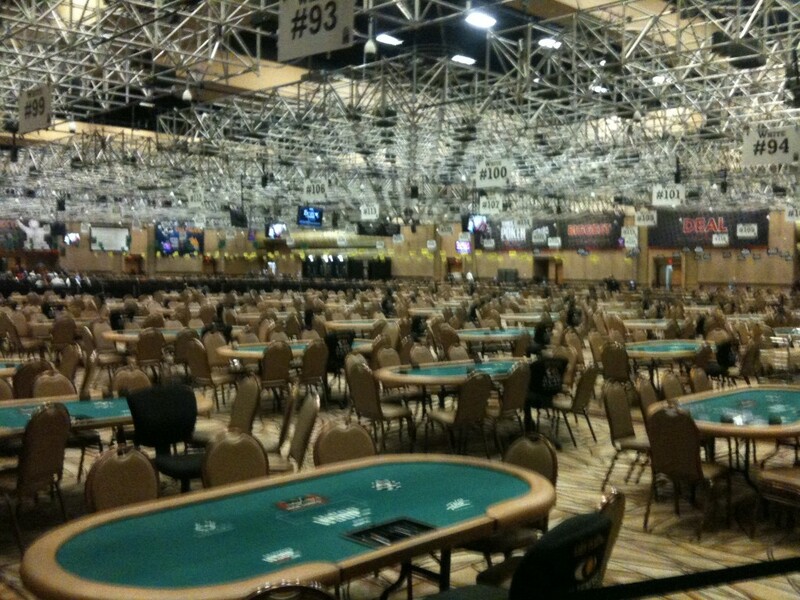 About 2:47am we set the final table. I didn’t have much to work with, and with the blinds as high as they were, I lost 100,000 chips just to blinds and antes in half-an-hour. Then at the end of the top of the hour, BTN just calls ahead of me in SB, I call, and BB shoves. Oddly, I didn’t record what I had, but note that I was up against QxQx and made a flush on the river. My last note from the game is that I had T343,000 with the chip average at 394,200, which meant five players were left. People were getting tired, and while I could easily have gone on, with everyone more or less evenly-stacked, we decided to take our money and run. Seven hours and fifteen minutes. +1,690% ROI. Five-way even chop, 117 entries. I could go on, like with a story about how I walked into a PLO8 game 45 minutes late while my car was getting serviced and managed to win it without buying the add-on; or the last two $10K games I played before I headed out to the WSOP, but the road between Reno and Las Vegas awaits and it’s way past the time I could be getting on the road here. Back in December’s “Why Not Rebuy?” article, I mentioned having trolled online tournament data to get an estimate of what the cashing percentage—more commonly referred to as in the money (ITM)—was for a good tournament player. Looking at the top ten players in a major PokerStars event ($10,300 buy-in) with 56,000 games between them, the ITMs were in the range of 13-17%. Those kinds of statistics aren’t—so far as I’m aware—available anywhere for live tournament play. The venerable Hendon Mob poker database keeps fantastic records of poker cashes, but not all entries. Some interesting databases have come to my attention in the past couple of weeks, however, and I’d like to share what I’ve been able to glean from them. WSOPdb.com has buy-in data gleaned from the PDF event lists posted on WSOP.com (available under the Reports tab for each event). It does a decent job of collating the data for each event and producing a list—searchable by player name—that shows entries for both 2011 and 2012, separated by year (events are automatically entered when the entrants list is available). The Quad Jacks WSOP Database goes even farther, with a database searchable by event and player. Want to see the names of everyone who cashed in (or entered) the 2011 Event #5 Seven Card Stud competition? Want to see how much Phil Hellmuth has paid for buy-ins and how much he’s won this year and last? Easy-peasy. Note: There are a few incongruities in both databases, which is only to be expected, considering that they’re generated by computer from documents that are themselves imperfect. There are some duplicate entries, there are some players with the same names and same home towns, there are players who listed (for whatever reasons) different home towns in different events, and players who cashed with no entries. I’ve tried to account for anomalies in the sample used for my analysis below. You can see from the chart above that Hellmuth entered 28 events in 2011 and cashed five times (three of the listings and three of the cashes are from 2012). He was guaranteed to be cash-positive for the series after a second-place finish in the 2-7 Draw Lowball Championship, and his ITM for the series was 17.85%. To determine a baseline for how well top players do in live tournament play, I decided to collate cashing and entry data from the Quad Jacks database (QJDB) and cross-check it with WSOPdb (I began my work before the 2012 WSOP began, which both were still undergoing some modifications, originally, I had to count the number of tournaments entered and cashed by hand). My overall sample set consisted of every player who made the top nine in a 2011 WSOP event. Collation was done by “hand”, requiring a look at each of the 58 tournament pages in the QJDB and a count of cashes and wins from the player page for each of the top nine players in the tournament (unless the player was already in the database). This phase produced a list of 462 unique players who were in the top nine players of at least one event. As a group, these 461 players entered 5,642 events and cashed in 1,059, for an aggregate ITM of 18.8%. The median ITM was 21.4%, however, because nearly a quarter of the players in the sample played fewer than five events. Players who managed to get to the final nine in an event usually made enough money that they could afford to buy their way into other tournaments or the Main Event, and many did. Even if they lost a chunk of their winnings (an eighth-place cash in a Limit Hold’em event might pay only about three times the buy-in for the Main Event), their ITM would be at least 25%. I was mostly interested in statistics for top tournament players, folks who got lucky in a tournament or players moving up the tournament ladder who were making their annual stab at the WSOP with a smaller bankroll weren’t the “top of the field,” even if they were good players. To limit the sample set to only top players, I added another requirement: the player had to have entered 20 or more tournaments during the 2011 WSOP. This meant they needed to be successful enough to have a bankroll (or backing) that could absorb a minimum of $30,000 of entries (assuming all they entered were $1,000 and $1,500 events) and that they were serious enough players that they were at the WSOP for a minimum of three weeks. 97 players made the cut. It’s a group with famous names like Tom Dwan and Bertrand Grospellier in it (and infamous names like Allen Kessler). Maria Ho, Phil Collins, John Racener, Eli Elezra, Chris Moorman. They’re all there (although I believe Ho and Odette Tremblay, who took 9th in a $1,000 NLHE event, are the only women). Although they’re just over 20% of the total number of players in the original sample, the 97 players with twenty or more entries played a combined total of 2,521 tournaments, nearly 45% of all the tournament entries for the complete sample. They cashed a combined 332 times, for an ITM of 13.2%, and the median ITM was 13.6%. Why look at an aggregate value rather than individual statistics? It’s well-known that tournament play is notoriously variable. Players can do phenomenally well one year and brick out the next. Raw numbers can be incredibly deceptive, as well. The two players at the top of the list in sheer volume of events entered are George Lind (2/39, ITM: 5.1%) and Justin Smith (2/40, ITM: 5.0%). Lind played in the pricey ($25,000) Heads-Up NLHE tournament to start with and didn’t have any luck until Event #11, when he took second in an the $10,000 Omaha 8 Championship for $287,554. He spent another $130,000 on entries between that win and Event #55, the $50,000 Poker Players Championship, when he scored big again with a sixth-place finish for $300,441, ending up about $345,000 in the black for the series. Smith, on the other hand, with exactly the same ITM as Lind, didn’t have a profitable series. The number of events he played meant that he was in many of the same games Lind was in, so his outlay was similar, but his two cashes were a sixth-place in the $10,000 Limit HE ($71,897) and 116th in a $1,500 NLHE event (only $3,684), so he ended the series with a loss of over $166,000. So I feel it would be a mistake to make assumptions based on a single player—or even a small group of players—who had cashed in the WSOP. The criteria I have established for this sample: players who have reached the top rungs of their peer group at least once by making what is essentially the final table of an event at least once and who have been tested repeatedly against the best of their peers by entering more than a third of the events at the poker world’s premier contest, should be rigorous enough for us to make some generalizations about the group, however. First, it should be pointed out that having a tournament ITM in the range of the top players in the world doesn’t necessarily make you profitable. If you’re spending a significant portion of your winnings from one tournament on the buy-in for a larger tournament, then your tournament play by itself probably isn’t profitable. A number of the players on the list fall into that category. They might have made up for losses in the WSOP during the year by other tournaments or cash play, but the series itself was a loser. In fact, of the 97 players in the study group, 40 booked losses for the series despite having one or more cashes. Of the 57 players in the group who finished the series in the black, most of them (33) were profitable only because of their largest win; Take it away and they fall into a hole of red ink. Two players were profitable, but just barely, in the black for probably (far) less than their expenses for food and/or accommodation. One trend that was obvious throughout the work I did to collate this data was the influence of large buy-in events like The Poker Players Championship ($50,000), the Heads-Up Championship ($25,000), and the ten $10,000 Championship events culminating in the Main Event. Many of the players on the losing side of the study would have been in the black (or at least a lot closer to even) had they not played several of those events. Doubtless, many of them could afford to, because they could make up the money elsewhere, but it looking through the individual player statistics does provide an object lesson in bankroll management for those of us inclined to take a shot at a big game. Over and over. A final note: These are only players who entered twenty or more events and made the top nine positions in an event. Undoubtedly, there are many more players who entered twenty events and had profitable years without making the top nine of an event (72nd place in the Main Event paid more than first place in the $1,500 2-7 Draw Lowball event). There are undoubtedly players who lost more than the players in the sample, as well, not having gotten one of the top prizes in an event during the year. But I think this group provides as good a look into the statistics of top poker players as I’m likely to get without access to the entire WSOP database. Below is the sample of players who entered 20 or more events during the 2011 WSOP and placed in the top nine positions of at least one event, sorted by the number of events entered and the number of cashes. First hand I called 175 with Kx3x and hit the bottom of the QxTx3x flop. I put another 400 out for the Jx turn but folded to a bet of 1,100 and probably missed a straight. At least I didn’t take the poison pot. UTG with K♣J♣ and I raised to 125, getting four calls. Opened with 300 on the KxJx4x flop and took the hand. Picked up A♥J♦ in SB and called a raise to 375 from CO with 3-way action. The flop was Q♠T♠6♠ and got checked around. A♣ on the turn and I bet 600, CO and BTN stayed in. I bet 1,000 with 4♦ on the river and took it down, but with the loss on the first hand I was only up to T8,350. I raised to 150 with K♥8♠ stringing along several others, hitting top and bottom pair on the K♠Q♠8x flop (it was a couple of very spadey hands). Nobody wanted to play when I bet. I entered the hand with a negligible 7♣5♠ and checked three streets with two aces and three cards to a flush on the board with me having nothing stronger than a 5x on the river. Somehow, nobody else wanted it more than me. My bet on the river took the pot! Kx9x and middle pair on a flop of Tx9x5x won. Forty minutes in and I was up to T9,600. Called 700 pre flop with Qx8x and got a KxQx7x flop to pair, but folded to an all-in bet on the Ax turn. The hand went to showdown; a Qx on the river would have given me the winning set. Won a nice pot with JxTx but lost a bigger pot of a couple thousand shortly thereafter with Jx9x. I made top pair on the nine-high flop but a river Tx gave my opponent two pair. Made a small raise with KxKx and was ready for fireworks after the AxKx6x flop, but everyone folded when I bet the turn. The loss with the jack had cut a chunk out of my stack, leaving me with just T6,650 at 75 minutes. 30 of 34 players were left. I raised UTG with QxTx and got two calls to the QxJx8x flop. The BB went all-in and I called, the third player opted out, and BB showed his own QxTx. We ended up chopping. Called 1,175 with JxTx with 3 other players to the flop. It was 5xQx5x and got checked around. A Qx on the turn was also checked. The Tx river card twitched my nerves and I shoved all-in for the first time in the game, taking down the hand. Last hand before the break, I had K♠8♣ and raised to 800 from CO. Two players called, the flop was Qx7x5x, and I folded to a SB bet. I went into the break with T8,635, nearly 2,000 below average, and got the T4,000 add-on. Once the break was over, I went on a sort of mini-roll, taking three pots in a row without a showdown. UTG2 with Ax8x and an eight-high flop got me the first. UTG1 with a AxKx took the second when I bet on the river ace. QxQx UTG I raised pre-flop and got a couple callers, SB checked dark and I went all-in on the ten-high flop. Gotta love those dark checks. In ten minutes, I’d picked up over 11,000 chips, putting me above average (14,923) and over 20,000. Had a bit of a setback a couple minutes later with 4x4x on BTN. I hit my hoped-for set on the turn, and re-raised over a raise of 3,000 from CO, but his KxKx made their own set on the river and I was cut back down to 13,200. I laid low for about 15 minutes, then saw 7♦2♦ through to the flop in BB at 400/800. I bet 1,200 on the 9x7x3x flop but folded to a 3,300 raise. On BTN with 10,400. Another premium hand: 8♠3♠. Average stack was 15,520. Another 20 minutes and I was all-in with Ax7x in BB to take the pot. Then I laid down an Ax5x to two all-ins ahead of me that would have won against 8x8x. I’ve been tossing a lot more weak aces than I used to. Can’t say the results have been bad. Two-and-a-half hours in and I was holding T12,200, with the average at 16,689 and 23 players left of the original 34. Called a 1,200 bet holding 8x3x from SB and got a flop of AxTxTx. Not much there. It got checked through, the turn was 8x and I bet 2,500 getting a single call. The river ace counterfeited anything I might have had and I folded. My all-in with [kq] crushed an [ak] with a queen on the river and just about eliminated the other player, then I got AxKx, AxQx, and QxKx again in three consecutive hands, doing some severe damage around the table, building my stack up to T30,000, and helping to bring the number of players down to 18. At the three-hour mark, we were down to 15 players. I had T28,000, a little above the 25,866 average. On BTN with AxKx just after the hour and I was all-in over CO’s all-in with AxTx. The flop put a ten out and my heart sank, but there was a jack-high straight on the board by the river, and we chopped it. Next CO and I raised 4,000 with 6♠7♠ to take the blinds. T32,000 at the second break. Coming into the third session, I made two knockouts in a row raising to 4,500 with J♦9♦. One caller and we see a queen-high flop with a jack on it. He goes all-in and I call his Kx8x. He misses both the turn and river. Next, I called an all-in with Ax8x against Tx9x and won. My next hand I had Qx9x and tossed it pre-flop with a raise of 15,000 out there, but it would have won the way the cards played out. UTG with Q♦9♦ and I raised to 4,500, got a caller, then BB went all-in for 20,500. I folded, SB called, and BB’s 7x7x took the day. It would have taken a bigger chunk of my day, too. Trying to play more defensively these days; I might not have laid that down a month ago. Three hours and thirty minutes in, T55,000, with the average at 35,275 and ten players left. We got to the final table five minutes later and I was placed in seat 1 on BTN. My second hand, I raised to 8,000 with AxQx over an UTG2 call and took the blinds and the call. When BB got around to me, I called a CO raise of 6,500 with 6♥3♥ and shoved all-in on the Kx6x3x flop to win. I showed. Encore regular SH was sitting to my right, and on the next hand the flop is Jx6x3x and he goes to showdown with 6x3x against AxJx but the turn and river are both fours and he’s counterfeited. The button’s dead and both blinds are short-stacked when I’m CO and action folds to me. I min-raise with Kx4x and get called by BB. The flop is KxQxTx and I put him all-in. Apparently, he thinks I’m just pushing him around. He calls and becomes the next player knocked out. Got a little frisky in BB on the four-hour mark and called a raise to 11,000 with just 8♦9♥. The flop was all hearts but I didn’t have it in me to call the all-in of 50,000 to see if my nine would be good. With Qx5x on my next BB, I called 6,500 against a big stack at the table and see a flop of Qx5x7x. Did he raise with the computer hand? I would, but not likely. Maybe he’s got a pair of queens. He bets 5,000 and I raise to 12,000, then he shoves all-in. I call and he flips AxAx against my two pair, which fills up with a five on the turn. The river’s a blank and I’ve got another knockout. On the next hand, I knock out the BB when I call from SB with Ax9x against his Ax7x. Four hours and fifteen minutes into the match and I have T153,000. Average is 97,000. Fifteen minutes later, I’ve lost some ground: 20,000 with KxQx and another 40,000 in a race with Ax9x versus 7x7x. By 4:35 in the game, I’m back down to T82,000, well under average. I called with Qx7x from SB and missed the flop, but bet 10,000 and got a call. Had to give up on the turn. Gained a little ground back with 5x5x and a raise to 18,000 from BTN, but my stack had dropped to T75,000 at 4:40. In SB with 5x7x, I called and the flop ran out a wonderful 4x6x8x. I checked, BTN bet 12,000, I raised to 25,000 and he called, which won me a very large pot. Almost immediately, however, I lost 60,000 on a hand where I held KxJx. Still, I was holding T142,000 nearing the end of the fifth hour. With blinds at 4,000/8,000, I did my duty with KxQx and raised over a call to 25,000 to win the call and blinds, and hit the five-hour mark with exactly 150,000. From here on out, notes get hard to take when things are short-handed. Suffice it to say that the final outcome was with me placing second after about five-and-a-half hours, for a nice cash in the newly-increased noontime guarantee game at Encore. And as often happens when I cash, I forgot to take the damn photo. Five-and-a-half hours. +646% ROI. 2nd of 29 players.